Please contact us in advance of booking to ensure this home is suitable for your group and planned use. In a wonderful location central to dining, shopping, the beach and the bay, Pacific Blue 5 is a spacious 3 bedroom, 3 bath modern vacation rental perfect for your next San Diego sojourn. From here it’s just steps to the lively ocean front boardwalk in Mission and Pacific beach and the same distance to the calmer bay front board walk and tranquil waters of Mission Bay. Located in a gated condominium complex the home is located on the second and third levels. An elevator or stairs bring you to the main level with entry hallway leading to the main living space where you'll find an open concept great room featuring a spacious and comfortable living area, centered around a large seating group and wall-mounted HDTV. Abundant natural light streams in from abundant windows and sliding glass doors. In the evenings, this will provide the ideal spot from which to enjoy a favorite TV show or sporting event. The fully equipped kitchen features stainless appliances (GE Profile range, side by side refrigerator and microwave above the stove), and slab granite counter tops. Dining is convenient as the dining area is a natural extension of the kitchen and overlooks the street scene below. Comfortable seating accommodations for 6 at the table and 4 more at the breakfast bar ensure that the group can enjoy a meal together along with lively conversations, laughter and stories of the days adventures in San Diego. Just off the dining area is a cozy outdoor patio which will be the go-to spot to sip your morning coffee and later in the day, the place where you can share drinks and watch the beach goers head home along Mission Blvd after a long day in the sun. The main level also features a hall bathroom with a tub/shower combo and off the hallway is a bedroom with a queen bed, ceiling fan and direct access to the patio. Up the stairs to the second floor of Pacific Blue 5 and you’ll find boasts a lovely Master bedroom suite, complete a king bed, ceiling fan and plenty of windows to let in that California sunshine. The sumptuous Master bath features a soaking tub dual sink vanity and a large glass-walled shower. Just down the hall is another bathroom with a tub/shower combo and bedroom 3 featuring a bunk with twin over full and a twin trundle. This bed can sleep 2 and up to 4 with kids. This floor also has a nook space for kids to play. Parking is at a premium in Mission and Pacific Beach so guests here will appreciate that there are 2 dedicated spaces in the secured parking garage. The spaces are full size in length but rather narrow so keep that in mind if you have large vehicles. This San Diego beach house is conveniently located near many amenities. Close walking distance to shopping, grocery store, beach shops, fitness club, night life, yummy local restaurants, and directly across the street from the Catamaran Resort Hotel and Spa with restaurants, boat rentals and river boat paddle wheeler that cruises Mission Bay. 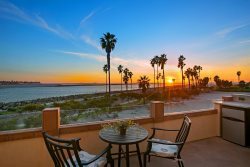 Bluewater San Diego welcomes you and invites you to come and enjoy an exceptional San Diego beach vacation from this centrally located vacation rental. Bikes, beach chairs and toys are not included; however, Bluewater has arranged discounts with local providers that can deliver customized orders based on your specific needs. Ask your vacation planner for details! Please note: There is no parking allowed in other residents' spaces. Belmont Amusement Park: 1.5 mi. Seaworld San Diego: 3 mi. Balboa Park and Museums: 8.5 mi. Torrey Pines State Reserve 9.5 mi. USS Midway Museum 9.9 mi. Downtown San Diego / Gaslamp : 9.9 mi. San Diego Zoo: 10.7 mi. Great service. Easy to book. Im an easy going person but Im sure if I needed anything at all, I would just have to contact blue water vacation rentals and they would have attended to my needs. Great location. It can be a bit noisy but the windows block out all the noise when you close them. If my family ever needs another large rental place we will search blue water first. Thanks for checking in before and after our stay. We would definitely use Bluewater Vacation Homes again! This was perfect for our group of 6 which included children ages 5 & 8. Our family of 4 took the upstairs while grandma and grandpa were happy downstairs. The staff was very friendly. I appreciated the phone calls to make sure I received my check in information and the call to see if our stay was okay. Everything we needed was there which helped make our stay relaxing. The home was great; the location, the size of the home, the decor and most of all it was clean. I would recommend staying here and if Im back in San Diego this will be my home again. Bluewater Vacation Homes takes care of you and communicates very well. This is a very nice unit. We really enjoyed our stay. The B5293 Pacific Blue Five vacation home was absolutely beautiful! It is a 2 story/ 3 bedroom home with a balcony off each room and very nice furniture. It came equipped with everything you would need (cooking utensils, toiletries, laundry soap, outdoor grill, etc.). The location was perfect - 2 min walking distance from the beach, grocery store, liquor store and more bars then you could visit. It had gated parking which was easy to access from 2 different streets. It would be perfect for a family or large group of friends. Bluewater staff was easy to work with, accommodating our every need. We would much rather stay here than a hotel room. We highly recommend this condo!